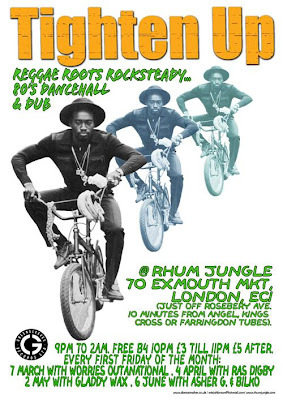 Rhum Jungle is the name of the venue and it's located beneath Cotton's Caribbean Restaurant. It's an atmospheric basement club which should suit the night right down to a T.
As ever, the music policy is: Ska, Rocksteady, Vintage Reggae, Roots, Old-Skool-Dancehall and Dub from residents Mistah Brown and Tim P with The Mighty Champion MC on the mic. Admission is free before 10pm and the only dress code is: No hoods allowed.